Got a case of the Mondays? You're not alone. Unless it's a long weekend I start dreading about Monday the moment I wake up on Sunday (I'm not even kidding.) Nevertheless, instead of getting all depressed about the damn day we can start by thinking positive thoughts, more specifically thoughts about tasty food like oysters, ceviches, tartares, and drinks like wine, cocktails and beer. Thanks to Raw Bar Mondays at Buonanotte, Mondays will never be the same again. Every Monday starting at 5pm till close, Buonanotte (Twitter: @BuonanotteTO, Facebook: Ristorante Buonanotte Toronto) will make your Mondays exponentially better. What you can expect are the following: $1 oysters, half price wine, $5 Negroni, $5 Aperol Spritz, $5 Peroni and Moretti, and a special raw bar menu featuring tartares and ceviches by executive chef Davide Iannaci. See what I mean? You're stomach will thank you. I visited Buonanotte specifically for their Raw Bar Mondays promotion three weeks ago, and because I'm such a keener I arrived right at 5pm (this explains why the place is empty). Who goes to a restaurant at 5pm? This girl. But meh it's how I get awesome room shots like these. After 21 years in Montreal, Buonanotte finally opened its second location in January of 2013, taking over the former AME space on 19 Mercer Street. The supper club serves contemporary Italian cuisine with modern twists and seats an impressive 160. The decor features a stunning copper lattice ceiling installation along with wood paneling, white leather banquettes, and a massive black and white vintage photo of an Italian street that spans the entire wall. Hmmm I see a wood fired oven tucked away in the corner of the pizza station...but more on that later. Since Buonanotte is a "supper club" the space does turn into a club after dinner service and features live DJs from Wednesday to Saturday. Without further ado, here's a look at what I had at Buonanotte's Raw Bar Mondays. Buonanotte's manager Tarek Gader highly recommended Norman Hardie's Calcaire to go with my oysters. Shucking away at PEI oysters from Rodney's. 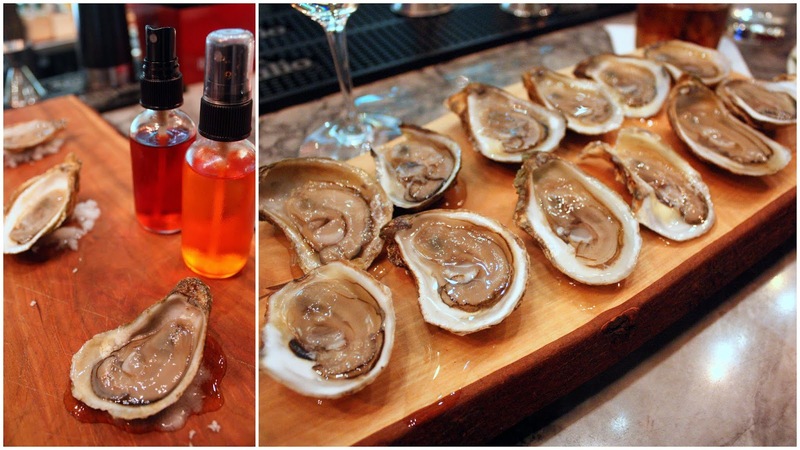 Ever had Negroni or Aperol Spritz with your oysters? Well, that is what are in those mini spray bottles. Neat idea but I still prefer the traditional lemon / horseradish / tobasco. The selection of ceviches and tartares changes every week, with each plate ranging from $10 - $14. My favourites out of the three were the creamy salmon tartare and the gorgeous ahi tuna and snapper mosaic. Despite that it was Raw Bar Mondays I couldn't help wanting to try their pizzas after seeing that wood fired oven. Chef Enrico Dal Sasso was so nice and took the time to explain to me some of the factors that are crucial to making a great pizza and crust, such as the type of tomato, the pH of water, the flour milling process, the humidity preservation in wood, and the type of wood used. All their pizzas cook for 40 seconds in the 1100 F oven. Crushed San Marzano Tomatoes, Fior Di Latte, Parmigiano Reggiano, Basil and EVOO. Incredible pizzas. The Margherita, without a doubt, ranks among the top Margheritas I've had in the city (to put it into perspective my favourite pizza place is Pizzeria Libretto). I still dream about that airy, fluffy and light (yet crispy) crust that's slightly burnt around the edges. The soft and smooth dollops of fior di latte is in perfect harmony with the crushed sweet tomatoes. Looks simple enough but knowing how much thought, experience and expertise goes into making a great tasting pizza, it's anything but easy. All I can say is that Buonanotte is underrated for their pizzas. Seriously underrated. Do yourself a favour. Don't fight with your internal fat kid on Mondays...it's not worth it!